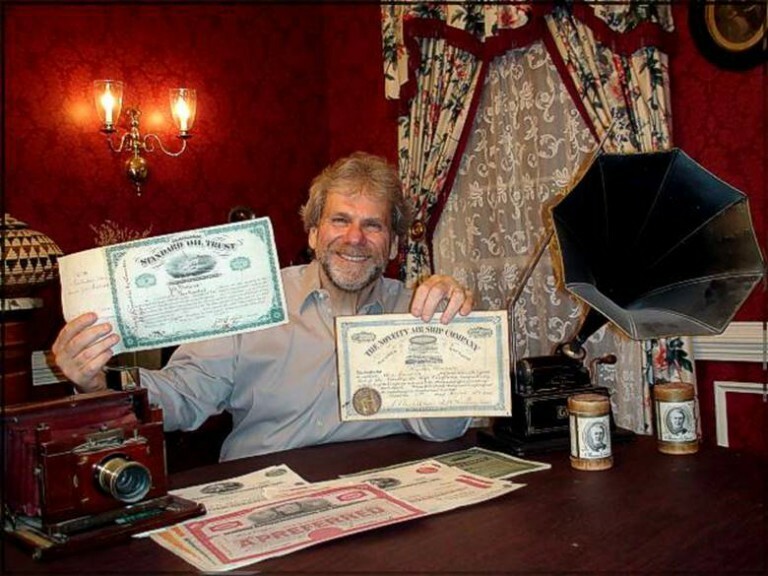 Owner of several striking internet addresses such as bob.com and scripophily.com Bob Kerstein has been without doubt the most active and successful pioneer in using the internet for scripophily. Very early he had an idea how the internet could change the trade of scripophily items and what it could do for promoting the hobby. Trading collectible stock and bond certificates since 1990 his online shop opened six years later in 1996. His affiliated business oldcompany.com undertakes research on old companies and old stocks. In 2011, he acquired the RM Smythe Old Stock & Bond Research Archives which he merged it into his OldCompany.com stock research service. Bob has a strong background in accounting and in the internet business. He is a Certified Public Accountant and has been the Chief Financial Officer of several publicly held communications companies. As Chief Information Officer of the Vancouver Grizzlies and Vancouver Canucks he was responsible for the first team websites in the National Basketball Association (NBA) and the National Hockey League (NHL). During the dot.com hype he was involved in the founding of several related enterprises. When the first internet bubbles blew off on the stock market he was the first to have the stock certificates in his hands. For the US media he is the expert to ask about hidden treasures behind old financial documents or these papers as collectables. Today the inventory of scripophily.com consists of some 17.500 different papers. With his long history his offers are often the first hit when searching with Google for a specific company. This way he attracts first time scripophily buyers and affluent buyers looking for any item (as gift) related to a specific company. An asset that prevents him from being forced into competing on price. His inventory can be searched by city, state or branch searchwords. So it is worth inspection also by advanced collectors. Bob has been member of the IBSS since 1998. He also founded the Professional Scripophily Traders Association (psta.com) and co-founded the ScripophilyUSA and Sharing Stocks program for kids with Scott Winslow and the Museum of American Finance.